The Hyperco product line includes suspension coils (Hypercoils), Hydraulic load centering Spring Perches and Composite Leaf Springs. Hyperco specializes in the development and optimization of these products for the motor racing industry. Hyperco components are utilized by championship winning teams world wide- NASCAR Nextel Cup, Formula One, Indy Racing League, SCCA, NASCAR Busch series, NASCAR Craftsman Truck Series, Grass Roots Oval Track, Endurance Sports Cars, Off Road, Motorcycles "Hyperco components are a part of winning from Late Models to Nextel Cup"...Formula Ford to Formula One, (Hypercoils have been utilized by every Indianapolis 500 winner since 1965). 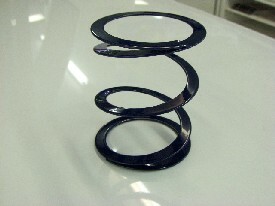 Hyperco's Largest Selection of Hypercoil Spring Rates Available. Also Called Helper Springs. The Hyperco Hypercoil CS100 Keeps The Coil Spring Seated When All Weight Is Off. 2 1/2" Id X 4". Use With BRP597 Spring Slider.